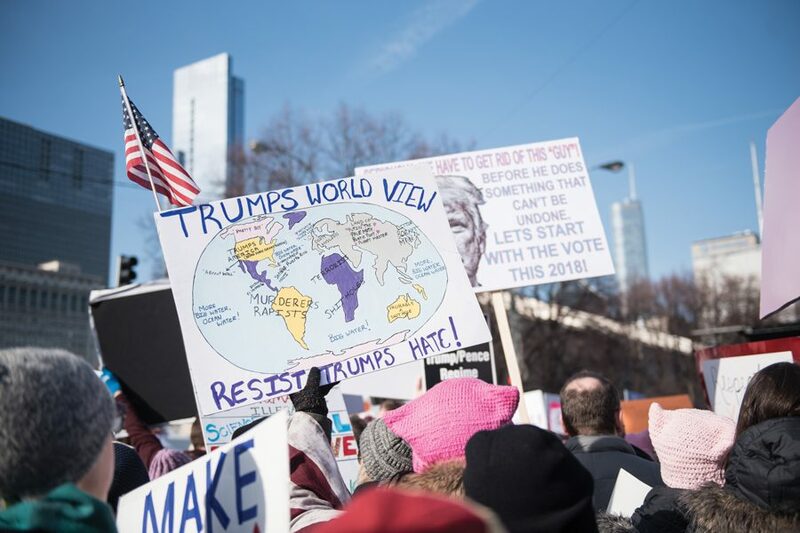 A sign at the 2018 Chicago Women’s March. In response to Trump’s new immigration policies, Evanston residents gathered on Monday to discuss how to support immigrants. Evanston residents and members of faith-based organizations received training on Monday about how to support immigrants who are vulnerable to deportation. The Beth Emet Social Action Committee, Evanston Solidarity Response Team, Evanston Public Library and the American Civil Liberties Union hosted the event at Beth Emet Synagogue. Speakers shared contact information for immigration rights groups and tips to avoid potential risks when dealing with United States Immigration and Customs Enforcement with about 100 people who attended the event. ACLU attorney Rebecca Glenberg said community members need to learn about resources available for immigrants — such as the American Immigration Lawyers Association and Chicago Legal Responders Network — so that they can provide assistance to immigrants who are “particularly freaked out” under President Donald Trump’s administration. Glenberg said community members should equip immigrants with an understanding of their rights in case they are stopped by police or immigration agents. Based on the Fourth Amendment of the U.S. Constitution, she said immigrants have the right to deny immigration agents without judicial warrants permission to enter their homes. She added that immigrants should not lie about their citizenship status, but they always have the right to remain silent. Abby Backer, director of youth programs at the Beth Emet Synagogue, told The Daily that the program aimed to create a “network of congregation” where every individual shares information about immigrants’ rights and strives to create a “sanctuary” within the Evanston community. “With everything that’s happening and how quickly things are changing, it’s really important to understand the history and also what we should be looking out for,” Backer said. Trump, during his campaign, promised supporters that he would build a border wall to prevent illegal immigration from Mexico. The Trump administration has also attempted several times over the past year to ban immigrants and refugees from certain nations from entering the country. Miguel Ruiz, the Latino engagement librarian at EPL, said people should acknowledge their privilege instead of holding a “savior mentality” during their interactions with immigrants. Ruiz said Evanston Township High School provides an array of resources, such as the Latino Advisory Committee, for students and their families. He emphasized that there are many ways for residents to get involved in supporting immigrants.